Mild in Colorado, bitter cold in the Midwest! Milder here, while the Midwest shivers! DENVER — A bitter cold air mass is pouring down from Canada and will grip the Upper Midwest over the next few days. The core of the cold air will stay well to the east of Colorado, so our temperatures will be chilly overnight, but not unusually cold for late January. 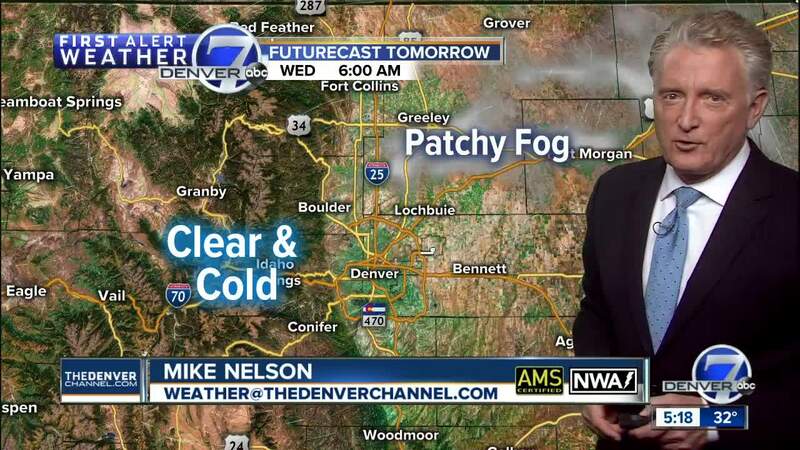 By morning, lows in the Denver area will drop to the low teens. In the mountains, the high valleys will have some very cold conditions with lows of 10 to 15 below zero in Gunnison and Alamosa. By comparison, temperatures will bottom out in the 20 to 30 below zero range in Wisconsin, Minnesota and Michigan. A few spots will be as cold as 40 degrees below zero early Wednesday! This cold wave in the Midwest does not mean the our world is not experiencing global warming due to the increase in CO2. This is simply a regional cold event - in fact, it is warmer in Fairbanks, AK right now than it is in Denver! If you want to learn more about what is happening - read my essay now pinned to the top of my FB/MikeNelsonDenver7 page. Sunny skies can be expected across Colorado on Wednesday with temperatures back to the mid-40s. In the mountains, highs will be in the 30s. Highs in the 50s are expected Thursday and Friday, with some increase in clouds and a chance for a little mountain snow by Friday, mainly over the southern mountain ranges. Saturday will bring increasing rain and snow to western Colorado. In Denver, expect mild temperatures, with increasing clouds and highs in the 50s for Denver and the eastern plains. Colder weather and a chance for some snow will return on Sunday.